Did you already achieve your 12 wins in Draft mode and got access to the Incubus? Even if not, you still have time. The Draft event runs until March 28th and if you cannot manage to achieve 12 wins by then, the Incubus will be available - like every other card - by spinning and crafting. Some of you were wondering after Update 61. In the in-game news section, a teaser appeared telling you that something mysterious will happen in ~46 days. Some assumed it's the release countdown. Well, it's not the release countdown! It's a countdown for another big, big update. We don't want to go into too much detail right now, but it's about new seasons, multiple cards per season (yes, themed card packs are a thing in Minion Masters), progression and more. Speaking of the release: the mysterious update in ~46 days is a major step towards the release. New seasons, multiple ways to progress and multiple cards per season are cornerstones to implement fresh content into Minion Masters and keep players busy until the next season. And don't worry, we also have new Masters in the pipeline... but not in 46 days. Our latest update came with issues. It goes without saying that we're sorry for that and we released a hotfix yesterday. There are still reported issues with stealth units like Styxi and Assassin, which we investigate right now. A big thanks to our community for reporting all these issues and providing us with additional information like screenshots, replays, short videos and the output_log. 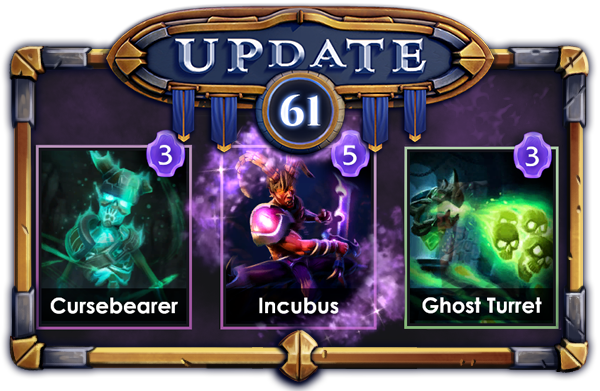 You're helping us improving Minion Masters! This week's blog post is kinda short, but we'll make up for that next week. The next few Community Happenings will present interviews with various people interacting with Minion Masters. Be it streamers, YouTubers, top or not so top players or even Dwarves... Have a nice weekend everyone!